The colds and flus that my friends are coming down with this fall seem to be more virulent than usual. It can be helpful to be reminded of things we can do to avoid getting sick. Helping our immune systems fight off ‘bugs’ and harmful bacteria is the goal. Did you know that you cannot catch the SAME cold twice? So your significant other or a child cannot re-infect you with the cold you gave to them. Once you fight off a cold you are immune to that specific cold virus. It will be a different cold virus that gets you the next time. Get a flu shot. Flu shots reduce your risk of flu by 50 – 60%. If you do get the flu, the vaccine can decrease the illness. Recipients of a flu vaccine cannot get the flu from it. The vaccines are made with a ‘killed’ virus. Recipients might get a short-lived low-grade fever or muscle aches which are the body’s immune response. Wipe off your phone, often. Colds and flu are usually airborne (from sufferers who don’t cover their mouths when they sneeze or cough!). That being said, germs can still be transferred from fingers to mobile phones. Clean the screen of your devices with a microfiber and then wipe down your phone case with a disinfectant wipe. 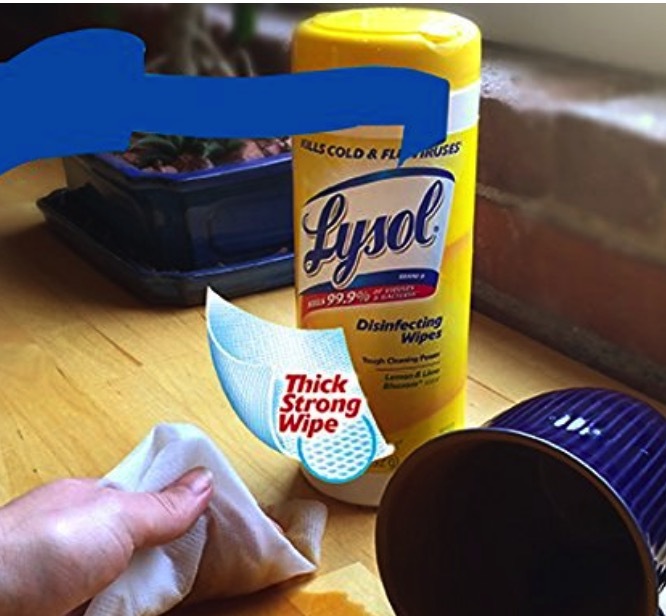 A pack of 4 Lysol Disinfecting Wipes is $11.69. Wash your hands or use lots of hand sanitizer. Send kids to school with alcohol-based hand sanitizer wipes and teach them to wash their hands often during the day. A study done in Boston found that people who carried hand sanitizer with them had 59% fewer cases of stomach bugs. Another study saw a 45% decrease in respiratory illnesses from the previous year among 45,000 study participants who washed their hands at least 5 times a day. Turn the heat down. Dry air upsets the balance of the protective mucous layer in our noses that help keep germs out, so viruses have an easier time invading our bodies. Try using saline nasal rinses to keep nasal passages moist and wash germs away. Get plenty of sleep. Eight hours is an optimal amount for adults. Enough sleep helps our body’s immune system stay healthy. Not getting enough sleep makes us four times as likely to catch a cold. Exercise. One study found that non-exercisers were three times more likely to catch a cold. Yoga with meditation and breathing counts as exercise as a study found that it enhanced immune cell functions. Don’t forget to stay hydrated by drinking lots of water. Try not to touch your face. Rubbing your eyes or scratching your nose makes you 41% more likely to develop upper respiratory infections. Even if you are washing your hands often, hands and fingers get re-contaminated quickly. Having long fingernails or wearing rings increases the microbes on your hands. Lower your stress level. Stress lowers our resistance to infections by depressing the immune system. Try taking time-outs from your tech devices and meditating instead. Exercise and getting enough sleep will help reduce stress. Don’t overdo the warm comfort foods of winter. As delicious as they are, they can be high in fat, sugar or salt. Don’t forget about winter fruits and vegetables that have lots of vitamins and minerals. Never reuse the same tissue. Not because you will re-infect yourself, that’s impossible, but because if there are still germs on it and you touch them with your fingers, you can spread them to someone else. In the same vein, you do not need to throw away your toothbrush after you’ve had a cold because you have immunity to those particular germs. Just don’t let anyone else use it. Check out ASE’s article on the everyday objects that carry the most germs. Are You Brave Enough to Try Whole Body Cryotherapy? These tips are excellent. Although I love all things Christmas/Autumn/Winter, I definitely feel that this time of year is when my mental health plummets. Good tips here. Especially to wipe your phones often. You might not realize just how filthy they can become. Thanks so much for sharing.